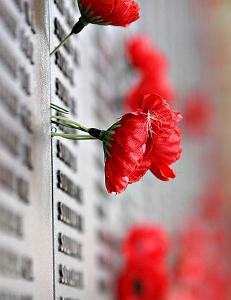 Today is Anzac Day so MJ is home for the holiday. I don’t know much about Anzac Day other than it’s a day of remembering those who fought in the war so I’m assuming it’s like the American Memorial Day. Everything is pretty much closed for today and on television the channels have been covering the Dawn Service and parade. We went to visit his grandfather’s memorial garden since he had been in World War II then we saw the reserved plots for MJ’s parents and grandmother. I must admit the memorial garden and cemetery were beautiful. It looked eerily inviting. Rather than a headstone garden, it was more of an actual garden with rosebushes growing from behind the grave markers. It got MJ and me talking about when we should start considering purchasing our own burial plot and what would we like (cremation or burial and so forth). So it’s been a bit of a somber day of remembrance. Share the post "Day of remembrance"